Ancient sports are sports too! Gladiator School will (maybe?) 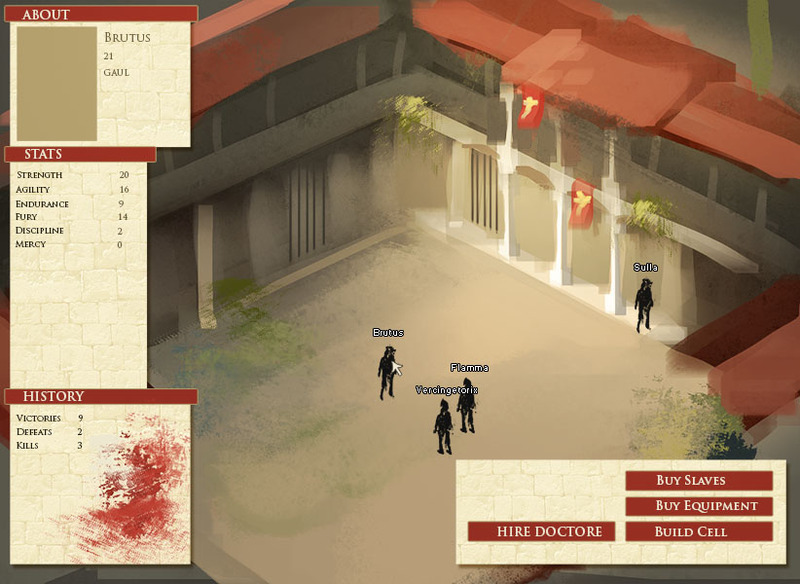 be a single-player simulation game in which you manage your own school of gladiators. Buy slaves and turn them into heroes of the arena. If the real game looks like this, then hnnnngh. Will the fact that you don't putting points in mercy have any aftermath? Like bad reputation or reception of town folks? A game like this, with deep economics, complicated diplomacy... I love the idea. YES! I love Spartacus: Blood and Sand. That's the idea, I'm doing the game art in Photoshop, same with the mockup, so the result should be very similar. The one problem I have is animation. I can't really animate, so I don't know how that'll pan out. So the game will look like this but better, because that painting is unfinished and that UI design looks horrible - I just wanted to get it out quick - but I'm not sure it will be interesting in motion. Well, you don't actually put points. You buy slaves that come with randomized points, and you increase these points by putting gladiators under teachers or fighting in the arena. Yeah, mercy will affect popularity and so on. So this is where the result of your schooling will be seen. I'm inclined to make this part of the game "unplayable": think of Football Manager games, since you don't directly control gladiators, just train them. You're a owner of gladiators, not a gladiator yourself. The gladiators will exchange hits, misses, blocks and, based on their stats, one will be victorious. I actually kind of like the blocky, unfinished style, but I'm fine with whatever you come up with. Instead of animating, you could simply have a number of poses and then have the player move/shake/make sound as it switches from one pose to the other- could be a style in and of itself. This is the second time I've felt moved to comment on a game in development this week, and both games are by the same person. Promise you'll finish them! I've wanted a game like this for years. So much potential... And I think you're right to go the Football Manager route and make it about strategy rather than action. Macte! The art looks gorgeous too. Sounds cool! Will you have to worry about uprisings? I imagine your gladiators are a little less willing than football players. More importantly, will it be localised in Latin?!? This is a great idea, I hadn't thought of uprisings. Yes, they have to be included! 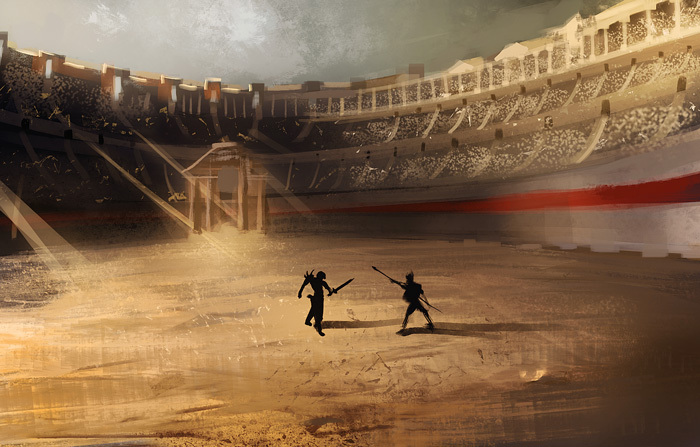 Gladiators fight in the arena. For now there is only movement and attack moves. Some elements present: movement rate, attack rate, weapon range, likeliness to move forward or backwards (cowardice or bravery) and some others I forgot. This is all AI, the player has no control over the fights, they happen according to the stats and skills of each gladiator. All you can do is train them and then they're on their own in the arena! Here you can see what I was talking about when I said I couldn't animate. I think I'll try Ashkin's idea of "poses" or non-tweened frames later on. Let me know if this looks okay to you. Hello, first of all, I wanted to say that me and my brothers are participating in the compo with a project that shares the basic idea behind yours (fight, arena). Fortunately our game focus on the fight, lets you control the characters and is fantasy-based so the similarities stop there. As for your game, since you said that there will be no direct control over the events of the fight, I think it could be interesting that the fighting takes place in a 'window'. I mean, you might think about having more fights simultaneously, thereby reducing the display area of the fight to a sub-area of the main screen. By this way one would not be a mere spectator of the fight of his gladiator and would enable the player to train other fighters or do other interesting strategic stuff while keeping an eye on the fight. Click to reset the positions of the gladiators in case they go off-screen or something.